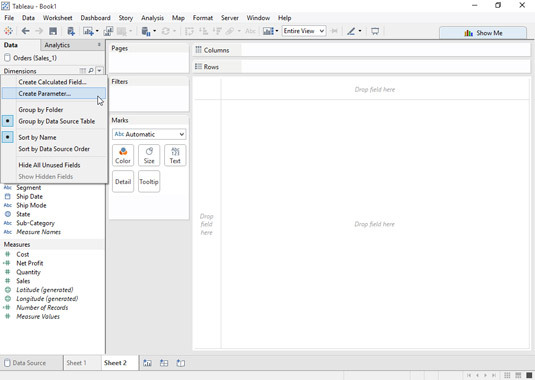 Click the down arrow to the right of Dimensions in the Data pane and select Create Parameter from the pop-up menu that appears. Doing so displays the Create Parameter dialog box. 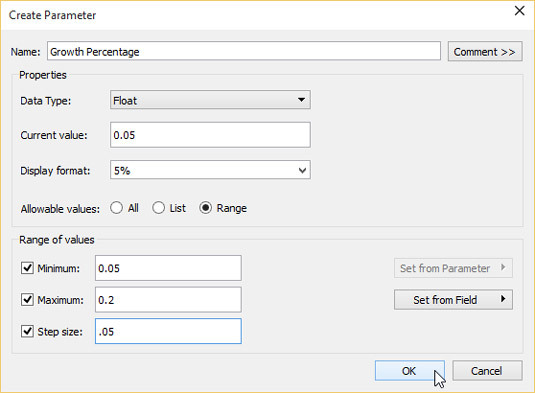 Enter a descriptive name for the parameter in the dialog box’s Name field. Enter a name that describes the parameter. Choose a name you will remember. 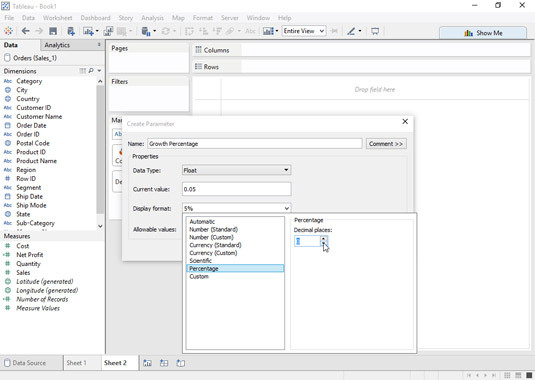 Select a data type from the Data Type drop-down menu. Choose the data type for the parameter. In this case, Float is a good choice because you want to have the parameter specify a decimal value. Enter the default value for the parameter in the Current Value field. In this case, .05 represents 5 percent, the minimum growth rate that you want to use in your view. In this example, you want the format to be Percentage with 0 decimal places. Finally, specify the allowable values. For this example, you want to use a range of values with a minimum of 5 percent, a maximum of 20 percent, and steps at each 5 percent between the minimum and maximum. Click OK to finish creating the parameter.